← Status of the Weather Enterprise? It’s Adulting! (Taking a step back) Do you self-identify as a member of the Weather Enterprise? Then you’re a major actor in helping seven billion people who aspire to live well on a generous, but dangerous and fragile planet. (Continuing the actor metaphor), you’re also on stage just as the Weather Enterprise itself is rapidly maturing in the process. The Academy focuses on a big piece (but still only a single piece) of the Weather Enterprise role in the larger world drama. To oversimplify: merely forecasting the weather is all about observations, physics, and computation. Moving beyond that to saving lives and property, to building a Weather-Ready Nation, and to supporting impact-based decisions may superficially sound like a small step, but it’s more of a giant leap. As complicated as the Navier-Stokes equations may be, dealing with them is simple compared with dealing with another human being – or a crowd. For most of the history of weather services, dating back to the mid-nineteenth century, the utility of those services has been compromised primarily by the poor quality of the physical forecasts: their limited accuracy, time horizon, spatial resolution, etc. The challenge has resided in the realm of physical observation and science, mathematics, and computing technology. Over the past twenty years, however, as physical forecasts have improved, the limiting factor has increasingly become the social part of the task. To be specific: engaging with individuals and institutions across sectors on all time scales – from urgent warnings themselves even out to years in advance (helping communities, local governments and decision makers balance policy-level reliance on evacuation against improved land use and building codes, siting and construction of critical infrastructure, and more). You might have noticed this during media coverage of the 2017 fall hurricane season and the California wildfires. Often the headlines didn’t dwell on the quality of the forecasts as such. Instead they focused more on the human dilemma – individuals and families, emergency managers, local governments, and critical infrastructure providers making high-dollar, even life-and-death snap decisions – and doing all this under conditions of uncertainty. Time and again over the past three months, millions of Americans have been forced to reconcile a soup of often-conflicting information against their personal experience and larger concerns. Throughout this past twenty years, it’s been clear that as individuals and a Nation, when it comes to such decisions and actions, we’ve been winging it, all too often in the process flying in the face of psychological, social, and economic realities as we’ve gone along. The result has been unnecessary loss, suffering, and community disruption. We can and should do better – on both sides of the Weather Enterprise-user interface. This starts with becoming as disciplined in our approach to social realities and the social science underlying them as we are with respect to physics of the atmosphere. 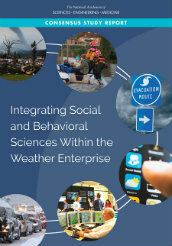 Develop a framework for generating and applying social and behavioral science research within the context of meteorology, weather forecasting, and weather preparedness and response. Assess current SBS activities and applications within the weather enterprise. Describe the value of improved integration and identify barriers to better integration. Develop a research agenda for advancing the application of social and behavioral sciences. Identify infrastructural and institutional arrangements necessary to successfully pursue SBS weather research and the transfer of relevant findings to operational setting. A bit on the findings and recommendations in a subsequent post. In the meantime, please give the full Report a look. Should also add in closing that the NAS and the committee gratefully acknowledge NOAA and Federal Highway Administration support for this study. MICHAEL EILTS, Weather Decision Technologies, Inc.
Laurie Geller, a senior program officer at NAS was the study director – our adult supervision. It was a privilege to be in the room with this group! Congratulations to you and Ann on an excellent report (I had the pleasure of working with her on a very different NAS study several years ago). It is amazing to me what a difference one word makes – Enterprise. If fully embraced, it means bureaucracy moves from control to collaboration, from management to leadership. But it also means that social and behavioral scientists must move from doing their own thing to working with other professionals toward common goals. Several years ago, the Department of Homeland Security declared an intent to do this in its Quadrennial Review but still hasn’t really succeeded. The goal is worthy but the path is far from straight. Thanks for this perspective, John. Once again you’re right on the mark. First, with respect to Ann: everyone should make working on a project with her a life goal! Her grasp of the subject matter; focus on the full breadth of the task but also myriad detail. (Positive) energy level. Respect for every team member. Seeing her in action has been a privilege. Second, with respect to the idea of “Enterprise.” Confess to having taken the word as a given/for granted rather than allow its fuller implications sink in. Will never be guilty of such complacency again. So glad you thought to make this explicit. Have been helped to see this by some recent stirrings internationally with respect to the idea of a Global Weather Enterprise. Has driven home how much we’ve benefited here in the U.S. by working on this basis since publication of the NAS Fair Weather Report back in 2003.